Full results from today’s Hal Rosoff Classic in California. 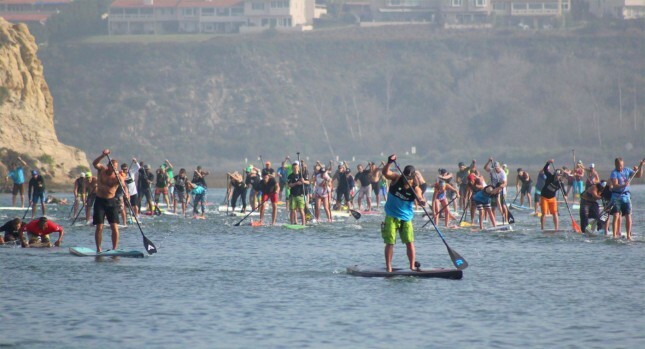 Held at the famous NAC (Newport Aquatic Center) training facility, the Hal Rosoff Classic is a bit of an institution in the southern California paddling scene. This year the race once again attracted a strong field – in total over 200 paddlers were out there on Newport Harbor this morning. Line honours in the 5.5 mile (9km) Short Course race went to Thomas Maximus on his unlimited. In the battle of the 14 footers it was Daniel Russell narrowly edging out Chance Fielder for the win, while visiting Frenchman Greg Closier was just 8 seconds further adrift in third. Belar Diaz was 4th, with Chuck Glynn taking 5th overall but finishing the quickest of the 12’6 paddlers. Meanwhile in the women’s, Riviera’s Shae Foudy put in a massive effort to claim both the division win and an overall victory. The Team USA young gun took line honours on her 12’6 in a time of 50 minutes 35 seconds, while Bailey Rosen was runner-up just over a minute behind. SoCal SUP stalwart Kristin Thomas was the 4th female over the line and comfortably won the Masters division. Great to see so many paddlers getting out there for an early season workout. It was also great to see a well-supported kids race, where two of the under 12 girls – Alexandria Higginson and Keagan Lamar – took the top two spots. Full results below. Check OnIt Pro’s Facebook page in the morning for their usual batch of 300-400 race photos.